Wow, I can't believe the Olympics are over! Those 2 weeks really flew by. I have several posts I'd been wanting to do about the Olympics that I obviously never got around to but this was such an interesting little fact I just had to share even if it's a day late. You know that the Olympic events have changed over the years, this was the first Olympics to have women's boxing and mixed doubles in tennis- I thought BMX was new this year but apparently it was added in the Bejing games. Softball and baseball were recently cut from Olympic competition which amazes me that there is still such flux in the games (not that I will miss baseball or softball because I won't), I guess it keeps it the "modern" Olympics. It will probably surprise you that for the first 40 years of competition in the modern Olympics there were medals given for painting, sculpture, architecture, literature and music. I mean can you imagine? The Olympic games would be even more so "the place to be" a gathering of even more talent. I feel like if art was still in the games fashion and acting would have been added- I mean how awesome would that be? Adding the Cannes Film Festival and Fashion Week to the Olympics- awesome! "Knockdown" by Mahonri Young won a gold in sculpture in the 1932 games. 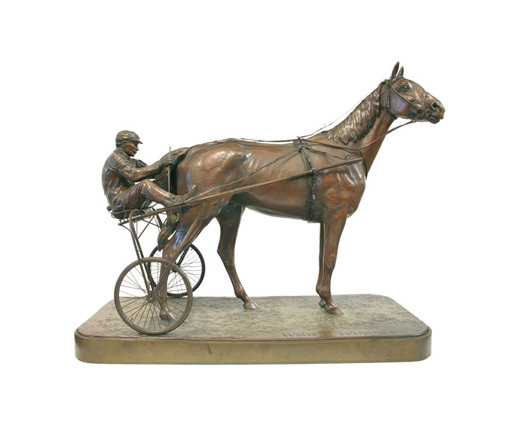 Walter Winan's won a gold medal for his sculpture "An American Trotter" in the 1912 Olympic games, he also won a silver for sharp shooting at those games and had won a gold in sharp shooting in the previous games. "Corner" and "Rugby" were submitted into the 1928 Olympics by Jean Jacoby who won a gold for "Rugby"
My personal favorite, a series of winter sports graphics by Carlo Pellegrini won a gold medal. Notice all of the art is inspired by sport, which was one of the requirements. The founder of the modern Olympics, Baron Pierre de Coubertin, felt that being a true Olympian meant that you were not only athletic but skilled in art and literature as well and he fought to have some aspect of the arts included in the games. The artistic component was eventually thrown out because it was argued the the artists were not "amateur" as was a requirement of the Olympics until 1986.